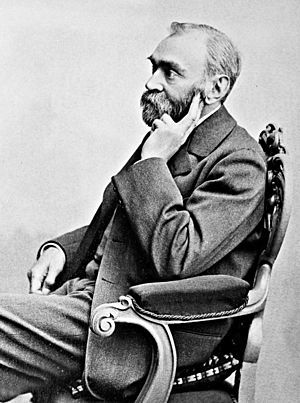 Alfred Nobel (October 21, 1833 – December 10, 1896) was a Swedish scientist, engineer, and weapons manufacturer. He is well known for the invention of dynamite and for creating the Nobel Prize. He left instructions in his will that his money should create the Nobel Prize after reading an article in a French newspaper that called him the "merchant of death" and said that he would be remembered for his invention of dynamite and its ability to kill more people than ever before. Nobel left 31 million kronor (the Swedish currency) to the awards after his death on December 10, 1896. Alfred was the third son of Emmanuel Nobel (1801-1872), born at Stockholm, but, at an early age he went with his family to St. Petersburg, where his father started a torpedo works. In 1859 this was left to the care of the second son, Ludvig Emmanuel (1831-1888), by whom it was greatly enlarged, and Alfred, returning to Sweden with his father after the bankruptcy of their family business, devoted himself to the study of explosives, and especially to the safe manufacture and use of nitroglycerin (discovered in 1847 by Ascanio Sobrero, a fellow-student with Alfred under Théophile-Jules Pelouze at the University of Torino). Several explosions were reported at their family-owned factory in Heleneborg, and a disastrous one in 1864 killed Alfred's younger brother Emil and several other workers. From the manufacture of dynamite and other explosives, and from the exploitation of the Baku oil-fields, in the development of which he and his brothers, Ludvig and Robert Hjalmar (1829-1896), took a leading part, he amassed an immense fortune. Then on November 27, 1895 at the Swedish-Norwegian Club in Paris, Nobel signed his last will and testament and set aside his estate to establish the Nobel Prize after his death (to be awarded annually without distinction of nationality). He died of a stroke on December 10, 1896 at San Remo, Italy. The first three of these prizes are for eminence in physical science, in chemistry and in medical science or physiology; the fourth is for the most remarkable literary work "in an ideal direction" and the fifth is to be given to the person or society that renders the greatest service to the cause of international brother/sisterhood, in the suppression or reduction of standing armies, or in the establishment or furtherance of peace. Alfred Nobel Facts for Kids. Kiddle Encyclopedia.